The following quotation, including the footnote, is taken from Appendix 1 to The Laws of Form. to the Collective (Common) Other Mind. There is a severe World-wide crisis in Education which is growing increasingly evident as to being uncorrectable by changing the System. Since all aspects of the Social condition depend ultimately on the continually evolving capabilities of each citizen through learning, this crisis is contagiously negatively affecting all human endeavor and diminishing Humanity Globally. Thus it is necessary to seed a Co-Creative (R)Evolution whereby education is wholly reinvented. With an ever-growing proportional scarcity in the required human resources for educating, the solution must have a significant technological component. In that the purpose of Education is to grow the Mind, this technology itself must exhibit an emerging Synthetic Intelligence. And finally, as the Human Experience becomes increasingly virtual through the Internet, so too must this Synthetic Intelligence grow into a Synthetic (Virtual) MindClone for each individual and thus serve as a personal Virtual Learning/Teaching Aide. Here are 10 emerging trends that could reshape your world over the next 10 years. “The liberation of education means every child has the right—not the obligation—to learn. Every child has the right to learn in as many ways as possible, following her interests and developing her unique talents. For that matter: Every adult has the same right. Learning is an individual activity. It has to be, because we are all different. That is why compulsory education with fixed, one-size-fits-all curricula is outdated. That system belonged to the industrial revolution, when schools were needed to train a uniform, obedient workforce to work in assembly-line factories. As we have witnessed the end of the industrial revolution, we are witnessing the end of the rationale for conventional schools. There is no need for standardized learning and standardized testing. No need for controlling what children learn. They shouldn’t study just what adults want them to know. Let’s correct one fundamental misunderstanding: Every person wants to learn something. No exceptions. By nature, children follow their interests and develop their talents. That is the very best thing they can do to fulfill their lives and to serve society. It is exactly what leading businesses have discovered: Employees flourish when they feel they have been able to make clear and meaningful contributions. 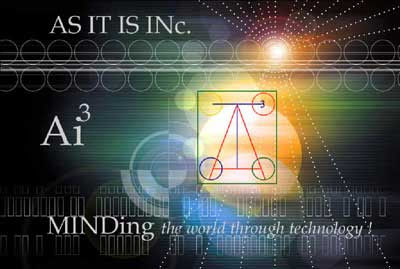 Ai3’s intention is to seed the Co-creative (R)Evolution in the way we educate. Grounded in Relationism as pointed to later herein, the mission—MINDing Humanity—involves growing the Learner Mind via an enabling, mentoring partnership with an individually adapted Synthetic Mind/an AutoGnome. This approach will ultimately completely reinvent education throughout the entire knowledge/age-spectrum. An important aspect of this approach is the requisite of maintaining an environment that fosters an individual’s natural inclination toward inquiry, inference and intuition. This quite simply implies open access to an open system through open sources. This obviously translates into specific criteria with respect to the physical space. The mission when actualized in an open environment will sustain a culture that encourages discovery guided by experienced, innovative experts/mentors(faculty) also working with AutoGnomic Aides. Such a culture will support a broad spectrum of interests providing the opportunity for students to holistically explore inter-disciplinary subject matter in an on-going, dynamic process recognizable as 24/7/365 entrepreneurism in learning. Curricula will include, as matter of fact and without emphasis, subject matter in the Public Sector Education Departments required fields which comply with all regulatory standards and testing requirements; however, this will not be treated as the educational goal of what will actually be presented and achievement expected, but only as a minimum compliance entry level for those individuals interested in such public certification. Performance success will be AutoGnomically evaluated on a cognitive (including inquiry, inference and intuition) as well as an emotive level. Students will be matched in their abilities with MetricGnomic Methodologies through the AutoGnome. Subject matter will be available in any accessible Automated Information Communication MultiMedi form and delivered locally as well as via internet access so that an anytime, anywhere attitude of access to knowledge is fostered. Students will have the opportunity to participate in cooperative learning activities that are unconstricted by age classification. Home study will be encouraged. Both parent and student participation are invited/expected within this culture of teaching, first as a contribution to our mission, but also as a means of validating their understanding of subject matter and as a method of building self esteem and competence in their ability to present complex material. Naturally, the demonstration of acquired knowledge is critical to the success of the program and will be given due priority. Equally important is the ability to move beyond the maintenance of accepted formalities and into the realm of creativity where students develop the confidence to initiate positive change in their environment. This specifically includes students with special needs which require and deserve the opportunity to explore any fields of study and select those that open them to realization and expression of their unique potential. The advanced capabilities of Ai3’s core intelligence/knowledge/wisdom technology, the AutoGnome, will provide a superior method for mentoring, guidance, assessment and evaluation (the MetricGnome) and will provide performance indicators that prove beyond any doubt that the students’ abilities are quantifiable and measurable and that such measures are superior indicators when compared to community/society/state required standard testing. Differentiating characteristics include the Relational philosophical foundation of the curriculum and methodology, recognizing the foundational relational proclivity of the human mind, and the emphasis on entrepreneurism. Key differentiators begin with the assumption of diversity in an open environment and entail a delivery method that utilizes high end Synthetic Intelligence technology to combine the best of expert mentors with independent and distance learning methodologies utilizing research-based best practices. Scientific Discovery in the twentieth century has seen the unification of the microscopic and cosmic realms of physics. Molecular biology has had equally epoch-making successes unravelling the intricate molecular mechanisms underlying the genetic code. Despite these conceptual advances, the principles by which the brain generates Mind remain mysterious. Mind and Consciousness remain so different from the usual objects of scientific inquiry that it is unclear they conform to the objective criteria usually applied to scientific description. Yet, the importance of developing a model of brain function which gives a consistent description of Mind, consciousness and free-will, is profound. The intractability of this central unresolved problem in science suggests its principles run deeper than the conventional biochemical description. This paper develops such a model based on linkage between the fractal aspect of chaotic neurodynamics and quantum non-locality, giving brain science a cosmological status at the foundations of physical description. This model links the structural instability of brain dynamics with quantum uncertainty. The quantum-physical brain may thus be more than just an interface between sensory input and decision-making. It may in fact be a doorway between complementary aspects of the physical universe. If so, the role of consciousness and Mind-brain duality may be central to cosmology. language(s) [sign systems] we use? Despite the foregoing Inigma of Mind, it is generally accepted that the human organism as a living (biological) system acts to maintain (adapt) its identity in a changing environment. These Acts are a decisional (CyberGnomic) dynamics characterizing “Mind” where Mind is generally conceded to be resident in a “Brain”. A Brain in turn is composed of a complex of parts, including, e.g., neuronal nets. Further, a Brain is carried by a “Body”, i.e. sensors and effectors, connecting the Brain/Mind to its environment. And finally, the key foundational assumption is that “Mind” is an image (sign/symbol)—creation/manipulation/storage/interpretation—system which itself is imaged via a Relational Science of Signs (symbols) — signification (e.g. symbolization) and communication, i.e. Relational Semiotic Systems, as a necessary basis upon which to build a General Theory of Universal Mind and technologically engineer its applications as Synthetic Intelligence–Synthetic Mind. The Mission then is to reinvent (create) a Form of sign(symbol) system and the processes attendant thereto which express the heretofore linguistically and formally (mathematically) inexpressible Experience of Interrelated Relations (as per the Native unrecorded expression of “relations related to other relations”), said Form to be combined with the centuries-old symbolic mode of Interrelated Systems, which in its successes has carried Humanity from the discovery of fire through the evolution of language and number to deep space exploration (telescopically toward the “infinite”) and nano-science (microscopically toward the “infinitesimal”). the methodology of inquiry in science? With last century’s advent of the digital revolution in information/communication technology, the methods of inquiry themselves must now be opened to form a new method of inquiry/inference/intuition. This method must be concomitantly applied to the foundations notions (philosophically, formally, and theoretically) themselves which subtend any particular experiential initiating hypotheses in inquiry thus leading to a theory of theory formation. An approach is posited herein regarding the formalization of an order and its derivative calculus, the latter taken as a formulation of the disorder experientially related to the given order, which also implies a reorder(ing) format that, within an Integrated System of order/disorder/reorder Relations (Relational Semiotic Systems), suggests The Form as a general [meta order(ing)] theory of theory formation. The Form will, in turn, be invoked in formulating a Theory of Intelligence/Mind and its technological implementations as Synthetic Intelligence/Mind. As a limited goal toward this end, we have attempted to elucidate our approach to “Semiotics in Intelligent Systems Development” as though it instantiated The Form and points to a generalized order (Boundary Logic) which, if fully realized, would translate Boolean Logic (the present form of Computational Logic) into a form that is more consistent with computation (being parallel) in contrast to language (being serial). The theoretical and applied detail developed to date is essentially confined to the AutoGnome, a semiotic machine interpreting certain of the philosophical principles of Charles Sanders Peirce who first published on Boundary Logic in 1898. The key commercial application of the AutoGnome to be implemented hereby is that of the WebGnome specifically in the form of an Intellisite (an Intelligent Website generically branded as http://www.truethinker.com/) and its derivative implementations in Knowledge Creation, Organization and Application. The IntelliSite taken as a Knowledge Development Management System (KDMS) is the adjunct tool of choice for Organized Search, Classified Storage & Retrieval, Learning/Teaching-Training, and Knowledge Management, to identify only a few of the many immediately adaptable applications of TrueThinker.com (TT.com) in it’s current stage of development. In the sequence of added increasing IntelliSite functionality, starting from the most rudimentary of functions, i.e. Manual Categorization, and progressing through Supervised (Automated) Categorization to AutoCategorization, Ideation, Meta(Q/R)Search, Community Building, Resource and Business Management, and on to an Autonomous Entrepreneur, TT.com can be adapted at each stage of development as a potent KDMS tool by incorporating an Inheritable Context-specific (e.g. for education, medicine, energy, environmental management, strategic economic and community development planning, etc.) KnowledgeBank (content). The fact is that with only Manual and Supervised Categorization, TT.com is already showing superiority relative to known competition as a KDMS and is expected to rapidly separate itself as the prime vendor in this industry niche. With the continuing evolution of the IntelliSite into an Autonomous Scientific Intelligence, CoGnome (collective intelligence), and (cognitive network of IntelliSites), TT.com will grow into a one-of-a-kind CogWebMINDClone in the NetWork of Virtuality, and become the benchmark for a SyntheticMIND. As an “immediately” available platform for revenue generation to sustain these ongoing development activities, TrueScholar.com for the HomeSchooling Movement would provide a readily accessible starting point for an already well-defined, politically active, participatory market. In particular, with an Open Source Initiative to accelerate the development of the initial KnowledgeBank, an effective learning assistance tool would be rapidly available. Moreover, from day 1 of completion of the design of the website and while the KnowledgeBank is formed, TrueScholar.com can go to market allowing users to complete their training of TT.com at the Manual and Supervised Categorization stage. In terms of decreasing ease of access to change agents for organizationally implementing Relational Education (REdu), the expected order of markets would be from Home(Independent)Schooling to Private Independent Schools to Charter Schools to Public Schools. With respect to the third of the 3M’s of education (Motivation, Mentoring and Measurement), a very rudimentary approach to Measuring Learning (both potential and realized) could be formulated based upon a quantification of the change in the average linkage “volume” in the Knowledge (Net)-Bank and the degree of relevancy (relative value) thereof. This could be effected by a MetricGnome in real time, all the time, as an online adjunct to MyWebGnome in TrueThinker. “Testing” then becomes a true measure related to true learning in true time of true relevance to the TrueScholar. This would stand in sharp contrast to the current norm of standardized testing as an indicator of successful Human Learning, albeit largely only of irrelevant, fabricated information. In order to set the stage for this design effort, it is suggested that first a traditional (“How should we test?”) Survey be designed and implemented, basically to inquire of the subject learners what they would recommend as the most fair, effective and accurate means of assessing their learning.